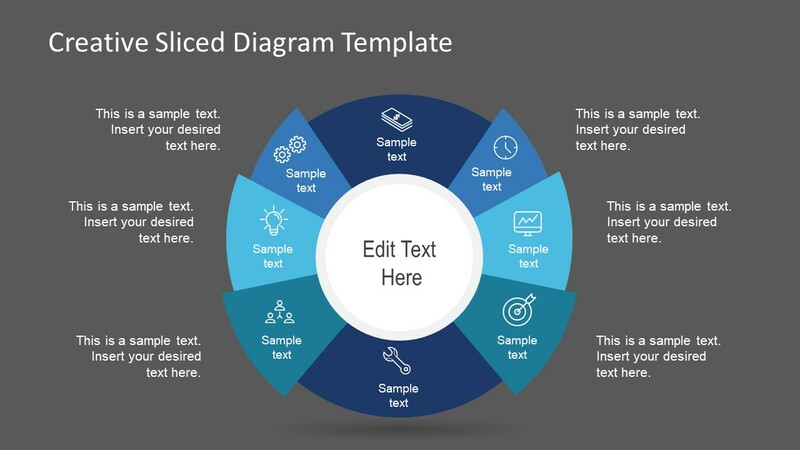 The Free Creative Sliced Diagram for PowerPoint is an eight-step infographic template. It is a circular process diagram aiding to deliver a professional looking presentation. The PowerPoint template of circular sliced diagram shows various curve-pieces connected to a circle in the middle. This shape in the middle depicts the core of concept presentation. For instance, this diagram assists in explaining all the features and functions of system visually around it. These could be independent segments of the main system, or user can create sequence by adding numbers in text placeholders. The creative sliced diagram for PowerPoint offers two free slides with assorted backgrounds. These background colors enable the presenter to choose dark or light theme slide to fit in original presentation. 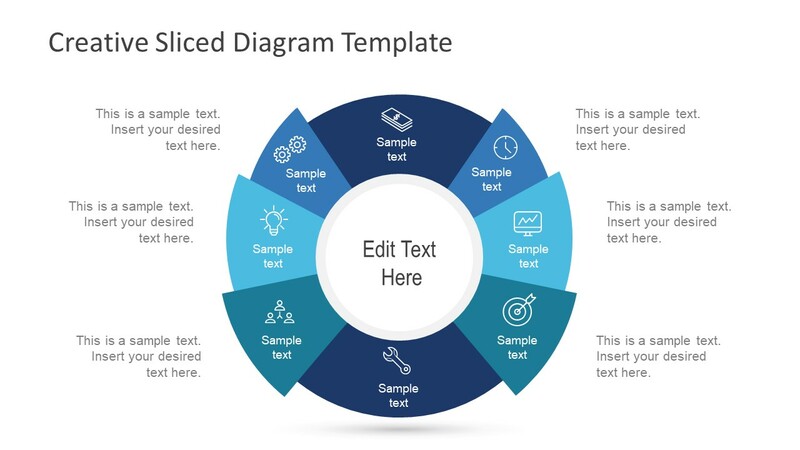 The Free Creative Sliced Diagram for PowerPoint is a cycle process presentation. This means users can explain concepts of continuing sequences like development lifecycle, quality control, integrating change through this diagram. Alternatively, it could display the segments of pie-chart in 8 parts. Use this diagram to display the workflow of segments giving attention to each part. The template of creative sliced diagram contains clipart icons and title text placeholders to represent individual segment. Whereas, the center shows text field which is easily replaceable by a graphic image. Further, the PowerPoint is 100% customizable template, enabling users to personalize it. Therefore, they can make changes in the colors, add or remove segments and insert various shape effects. The free PowerPoint of creative circular diagram is template of flat vector graphics. The use of infographic icons increases the visual representation of information. Furthermore, graphics intent to make quick and easy representation of complex information. 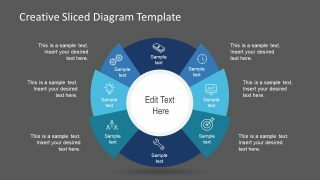 The creative sliced PowerPoint diagram is an easy-to-use slide and anyone can modify without advance PowerPoint skills. SlideModel presents 5 slide template of 8 step sliced diagram for its subscribers.